Do you read holiday themed books during Christmas time? I love too! In fact I have a special little Christmas box my parents gave me about ten years ago with some books in it. Now each year we bring it out when we decorate the trees and I re-read the books. I know I'm going to be adding this book - Where Treetops Glisten to that treasure! 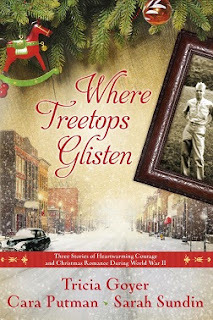 Where Treetops Glisten is really three stories in one set in the time of World War II. It features stories from three different authors: Tricia Goyer, Cara Putman and Sarah Sundin. Each author writes one story about a character from the Turner family. All the stories mesh and meld together making it a sweet combination. I always love when a book lets you get to know characters. This book travels us through the lives of one whole family over the course of a few years. It flows so beautifully even though there are three different writers. I felt like each character's tale was believable as part of the overall picture in the family. It is a unique book and one I'm so happy to have read. Each tale gives you just enough of the picture to pull you through the next story. You can purchase your copy of Where Treetops Glisten at your local retailer or online at stores like Amazon.